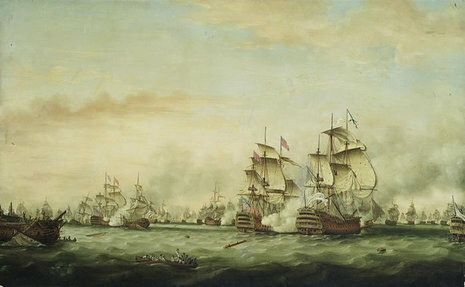 On 12 April, De Grasse bore up with his fleet to protect a dismasted ship that was being chased by four British ships as he made for Guadaloupe. Rodney recalled his chasing ships and made the signal for line of battle. As the French line passed down the British line, a sudden shift of wind let Rodney’s flagship Formidable and several other ships, including the Duke and the Bedford, break through the French line, raking the ships as they did so. The resultant confusion in the French line and the severe damage to several of the French ships including De Grasse's flagship Ville de Paris, 104, led eventually to De Grasse’s surrender and the retreat of many of his ships in disorder. This action split the French battle line into two. A general chase ensued. In all, four French ships were captured and one, César, blew up after she was taken. The British lost 243 killed and 816 wounded, and two captains out of 36 were killed. The French loss in killed and wounded has never been stated, but of captains alone, six were killed out of 30. It is estimated that the French loss may have been as much as 8,000. A total of over 5,000 French soldiers and sailors were captured. The large number shows what a considerable force the French were willing to put ashore with the invasion of Jamaica. Of the Ville de Paris' crew, over 400 had been killed and more than 700 were wounded. (April 12, 1782), in the American Revolution, major British naval victory in the West Indies, ending the French threat to British possessions in that area. Setting out from Martinique on April 8, a French fleet of 35 warships and 150 merchantmen under the comte de Grasse intended to descend upon Jamaica with Spanish help. They were intercepted at the Saintes Passage, between the islands of Dominica and Guadeloupe, by a British fleet of 36 ships commanded by Admiral Sir George Rodney. After preliminary skirmishing, the main action took place on April 12, when a shift in the wind altered the course of two French ships, causing gaps in their line of battle that were quickly entered by the British. The French fleet was thus scattered and the ensuing British victory at the Saintes helped restore Britain’s naval prestige. As a result, in the Treaty of Paris (September 3, 1783) Britain regained most of its islands in the West Indies.